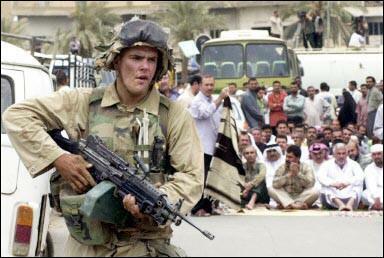 More Than 900 Iraqi War Prisoners Freed. Baghdad(Text:Associated Press, Photo: Reuters), 19:59, 18 April 2003. American forces released more than 900 Iraqi prisoners, beginning the process of sorting through the thousands detained in the month-old war, a U.S. defense official said Friday. "We stated from the beginning that we don't want to hold anybody any longer than absolutely necessary," said Maj. Ted Wadsworth, a Pentagon spokesman. "The process of sorting people to determine their status has begun." Those released were determined to be noncombatants, he said, meaning they did not engage in hostile acts during the war and were not part of a military force. For instance, they may have been civilians caught up in the fighting, Wadsworth said, adding that warring forces have the right and the obligation to take from the battlefield anyone who is a risk to security or who may be in harm's way. Two Pentagon officials said they believe British coalition forces already had released a smaller number of prisoners they were holding at a separate location or locations, but were unsure of the number or other details. Taking into account the releases announced Friday, coalition forces now hold 6,850 prisoners, Wadsworth said. A total of 927 were released. Wadsworth said he had no information on where they were released or any other details of their release. A tent city that could hold up to 24,000 prisoners is being constructed in the southern Iraqi city of Umm Qasr, but not all prisoners have been transferred there. Some remain at other holding facilities and some remain with the coalition units that captured them, he said. At the prisoner facility under construction, an interrogation facility also is planned, officials have said, adding that not all prisoners have been identified. Authorities also had problems obtaining the true identities of terror suspects from the counter-terror war in Afghanistan. Several hundred are still being held at the U.S. Naval base at Guantanamo Bay Cuba. There are no current plans to send prisoners to the facility in Guantanamo, officials have said. Among the nearly 8,000 taken prisoner in Iraq, defense officials have said there are a number of high-ranking officers. And in recent days, the capture of some high-level officials have been announced by war commanders. Defense officials hope to get information from them that might lead to the discovery of weapons of mass destruction which the Bush administration says the fallen regime of Saddam Hussein had - and which was part of the justification for war. Among the 927 released, there were two different processes used. Officials were able to determine 925 of them were noncombatants without holding a formal hearing, while the other two went through what is called an Article 5 proceeding before being labeled noncombatants and released. So far, seven people have been through such a hearing, which puts prisoners into categories that will determine whether and how they will continue to be held. That is, they are labeled noncombatants or combatants - and in the latter category separated between lawful combatants and unlawful combatants. Other than the two released after hearings, another four of the seven were determined to be lawful combatants, given prisoner of war status under the Geneva Convention and continue to be held; one was determined to be a doctor or chaplain and continues to be held to treat or minister to other prisoners. International conventions allow that the prisoners can be held until the end of hostilities. The Bush administration also has said it will prosecute Iraqi leaders who committed war crimes against American soldiers in this campaign and the Persian Gulf War of 1991. Meanwhile, the coalition continues to take more prisoners, pressing its hunt for former leaders of the Iraqi regime as well as weapons and securing Baghdad. Kurds in the coalition force captured senior Baath Party official Samir Abd al-Aziz al-Najim, marking the second time in as many days that troops have found someone on U.S. most-wanted list of former regime figures, the Central Command reported Friday. Thursday, U.S. forces grabbed Barzan Ibrahim Hasan, a half-brother of Saddam Hussein and a former head of Iraqi intelligence. There is still was no concrete information about Saddam's whereabouts or whether he had been killed in coalition airstrikes that had targeted him specifically. Defense Secretary Donald H. Rumsfeld said finding people who know details of any chemical, biological and nuclear weapons programs will be the key to disarming Iraq. "I don't think we'll discover anything, myself," Rumsfeld said at a town hall-style meeting with Pentagon employees. "I think what will happen is we'll discover people who will tell us where to go find it. It is not like a treasure hunt where you just run around looking everywhere, hoping you find something." U.S. troops have found a number of suspicious chemicals and facilities but tests on them have proved negative or inconclusive.